This weekly linkup is designed to linkup your BEST posts to inspire others to read, cook, craft, live well and blog well. Share with us anything that will help others live a happier and healthier life. Sunday is the perfect day to reflect and celebrate the week that passed and look forward to the week ahead. Our linkup is open all week long so feel free to stop by anytime, it’s never too late to linkup with us. 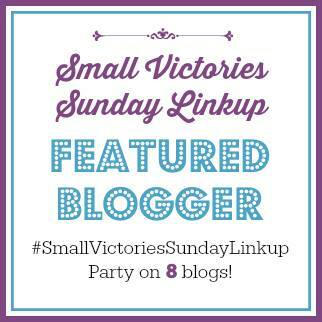 If you need writing prompts or to see past linkups, visit our main Small Victories Sunday Linkup page. Each week my co-hosts and I will feature our favorite bloggers from the previous week’s linkup. Visit each of my co-hosts to see who they’ve featured too! Stop by Mom’s Small Victories to see who earned the Reader’s Choice for Featured Blogger. As someone who also faces chronic pain from Rheumatoid Arthritis, I really enjoyed reading this piece by Brandi over at FibroMom on overcoming the depression that takes hold when you battle chronic pain. Each week I hope to post what I have been up to this week and celebrate some small victories of my own. The topic areas may change depending on what I’m up to, but will basically break down into the following: Homeschool, Cooking, and Home/Self-Care. HomeSchool: I am finally starting to get somewhere with my daughter and homeschool. I pulled her out of public school at the end of January due to many issues we were having. It has been a heck of a transition period. She thought homeschool would be all about watching YouTube and playing Minecraft, but nope! It has been a struggle to find the best curriculum and means to get her engaged with learning. I think we are making some headway the last few days after missing almost 2 weeks due to snow and the public schools being closed. My younger son, who is in first grade, is still in public school so when he was out, there was no way I was going to win that battle! Cooking: I’ve been switching it up for a few weeks using some Emeals menus that I’m trying out again. It has been a nice switch and provided me with some wonderful recipe inspiration. With a few tweaks here and there, I think you will really enjoy some of the recipes that I have coming up soon on the blog! Home/Self-Care: Being that I also suffer from Rheumatoid Arthritis, I am really trying to make sure that I get things at home running smoother and also that I’m taking care of myself. I work from home full time as a Happiness Engineer as well as working on my blogs, homeschooling my daughter, and everything else that comes with running the house. I’m the taxi driver, organizer, Queen of laundry, cook, teacher, wife, mother, and employee. It’s A LOT! I’m working on scheduling my days better, assigning some responsibilities to my dear husband, and putting my foot down some. However, this next week is going to be crazy as we prepare to go on vacation for Spring Break!